Visiting our office? Please keep in mind these parking instructions! Our building is at 811 Grand Blvd, on the corner of 8th and Grand Blvd. 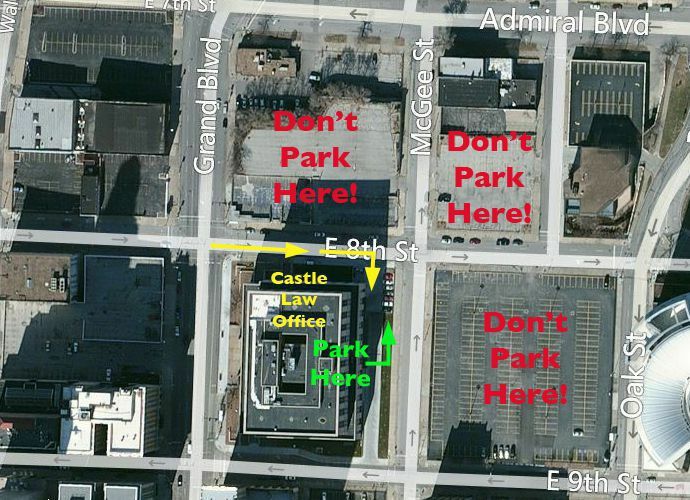 Turn east onto 8th Street from Grand (8th is one way) and go to the back corner of the building. This is past the bus stop and to the right on the back edge of the wooden fenced-in area. It will look like you are entering a driveway. There are four spaces designated specifically for you to park in that area free of charge. Our entrance is at the top of the staircase located on 8th Street. If you are unable to climb stairs, please let our receptionist know so that she can give you instructions on entering through the parking garage. If you have any questions, please call us at 816-842-6200.